Chelsea Green Publishing Company, 9781603587273, 224pp. 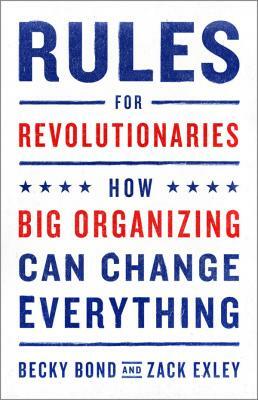 Rules for Revolutionaries is a bold challenge to the political establishment and the "rules" that govern campaign strategy. It tells the story of a breakthrough experiment conducted on the fringes of the Bernie Sanders presidential campaign: A technology-driven team empowered volunteers to build and manage the infrastructure to make seventy-five million calls, launch eight million text messages, and hold more than one-hundred thousand public meetings--in an effort to put Bernie Sanders's insurgent campaign over the top. Bond and Exley, digital iconoclasts who have been reshaping the way politics is practiced in America for two decades, have identified twenty-two rules of "Big Organizing" that can be used to drive social change movements of any kind. And they tell the inside story of one of the most amazing grassroots political campaigns ever run. Fast-paced, provocative, and profound, Rules for Revolutionaries stands as a liberating challenge to the low expectations and small thinking that dominates too many advocacy, non-profit, and campaigning organizations--and points the way forward to a future where political revolution is truly possible. Becky Bond served as a senior advisor on the Bernie Sanders presidential campaign and was an architect of the campaign’s national, volunteer-driven grassroots campaign. Prior to joining the Bernie Sanders campaign, Becky served as political director at CREDO where she was an innovator working at the intersection of organizing, politics, and technology for over a decade. Becky is a cofounder of CREDO SuperPAC, which was named by Mother Jones as one “2012’s Least Horrible Super-PACs” for helping to defeat five sitting Tea Party Republican Congressmen. She lives in San Francisco, California, with the writer, designer, and book artist Emily McVarish. Zack Exley served as a senior advisor on the Bernie Sanders presidential campaign and was an architect of the campaign’s national, volunteer-driven grassroots campaign. Zack was a union organizer before becoming MoveOn.org’s first organizing director in its campaign to prevent the war in Iraq in 2003. As an early advisor to the Howard Dean campaign, he helped transfer MoveOn.org’s early fundraising and organizing discoveries into presidential politics, and he then served as John Kerry’s director of online fundraising and communications in the general election where his team raised more than $100 million online for the nominee. Subsequently, Zack worked as a consultant to global NGOs, campaigns and companies, and served as Wikipedia’s chief community officer and chief revenue officer. He lives in the Ozarks with his wife, Elizabeth, and daughter, Esther.